Getting approved for your first credit card can be tough. You have to find a credit card issuer who will approve you even though you've never had credit before. If you've already found a credit card and you've been approved congratulations! If this is your first credit card, your credit limit may be smaller than you expected. Don't worry; it's perfectly normal to have a small credit limit when you're starting out with your first credit. Credit history is one of the factors credit card issuers use to decide an applicant's credit limit. A person with a history of managing credit well will have a better chance of getting approved for bigger credit limit. However, because you're a brand new credit card user, you don't have a history of using credit cards responsibly. Your credit card issuer doesn’t know how much credit you can handle and so they’ll usually start you off with a small limit. If it turns out you're not quite ready for credit, you'll only cost the credit card company a few hundred dollars rather than thousands. Your first credit limit may be as low as $100 if your first credit card is a retail store credit card. You might be approved for a slightly larger credit limit of $300 or $500 if your first credit card is a Visa or MasterCard issued by a bank or credit card company. It’s unlikely that your first credit limit will be greater than $1,500 unless you already have a credit history. For example, if you have a mortgage or car loan on your credit report. Without previous credit card experience, you may not know it's possible to have a higher credit limit than what you were initially issued. The average credit limit can give you an idea of what you can look forward to if you manage your credit well. The credit agencies that collect your credit history use a scoring model to measure your ability to pay back the money you've borrowed. Those with a superb credit history have a higher score than those who are frequently late with payments or have defaulted on their debt. VantageScore 3.0 is one of the models used by the credit agencies. Superprime consumers, those with a VantageScore 3.0 between 781 and 850, have the best credit history according to Experian, one of the three major credit bureaus. Considering the average consumer has three credit cards, that would mean the average person with excellent credit has an average credit limit of more than $11,000. On the other hand of the spectrum, the average credit limit for a deep subprime consumer with a credit score between 300 and 499 is just more than $1,200. Some high net worth credit individuals with excellent credit can have six-figure credit limits or credit cards with no preset spending limits at all. These individuals have higher credit limits because of their excellent credit history and ability to repay high balances. Don’t be disappointed by your initial credit limit. It’s actually better to start small until you’re used to handling credit. You won't get too deep into credit card debt as long as your credit limits keep you from overextending yourself. As you demonstrate you can use your credit card responsibly, e.g., pay your bills on time and avoid maxing out your credit card, you’ll qualify for higher credit limits over time. Some credit card issuers will increase your credit limit automatically after several months of timely payments. Others only increase your credit limit upon request. Wait until you’ve made your credit card payments on time for at least six months before you request a credit limit increase. You may be able to get a higher credit limit on your first credit card by applying jointly with someone, a parent or spouse, who already has an established credit history and good income. Another option is applying for a secured credit card whereby you place a security deposit with the credit card company for the amount of credit you'd like. For example, for a $2,000 credit limit, you would make a $2,000 security deposit. With a secured credit card, your security deposit is returned to you as long as you keep the account in good standing. If you want a secured credit with a high credit limit, take a look at the Wells Fargo Secured Mastercard. Applicants can make a security deposit up to $10,000 for a credit limit of the same amount. Starting out with a bigger credit limit - and managing it responsibly - will make it easier to get approved for unsecured credit cards with larger limits once you've established your credit history. Keep in mind your security deposit is off limits until you close your credit card, so only use money you can spare to secure your credit limit. No matter what credit limit you start out with, there’s always a chance for an increase as long as you’re not charging too much (less than 30% of your credit limit is best), you’re making your payments on time each month, and you're managing the rest of your credit well. Many credit card issuers review your account regularly and raise your credit limit automatically if you've managed your credit well. Capital One, for example, automatically increases the credit limit on many of their credit cards after you've made your first five monthly payments on time. If your credit card issuer doesn't raise your credit automatically, you can request a credit limit increase. 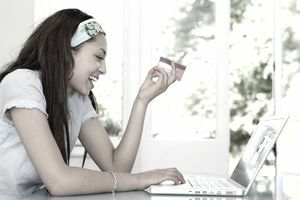 Many credit card companies allow you to request a limit increase online. When you request a credit limit increase, your credit card issuer will review your account history, your credit history, your current monthly income, and other debt obligations. If these factors are favorable, you have a good chance of having your credit limit increase request approved. On the other hand, if your request isn't approved, the credit card issuer will send a letter explaining why. The information in the letter can help you determine what habits you need to change to be approved for your next credit limit increase.